Before I start with my post, please remember, what I say here are my opinions, my words. I always invite comments to my posts, but if you are coming here to be judgmental, to troll, or to be downright nasty, YOU ARE NOT WELCOME! All I ask is to keep an open mind. You don’t have to agree with me, but you can respect what I or others have to say. I haven’t been vocal about the tragic accident that took Kevin Ward Jr.’s life. Here what I posted back on August 12 on Bad Groove. “I haven’t been vocal about all of this on Facebook or elsewhere. One I am still in shock about this past weekend’s events. The more stories I see about it, the angrier I get. I am angry with media outlets who have no clue about what they are talking about. They want to vilify Tony Stewart. All they show are the angry outbursts of this man. I don’t have blinders on when it come to Tony. He has a history of anger management issues. You can’t judge who he is as a person by those snippets. We have all had times where we have blown up in the heat of the moment. Those are just a fraction of what Tony Stewart is as a person. He is a loving and caring person with one of the biggest hearts around. Last year I read an article about the crash that left him with a broken leg. He made a last-minute decision to turn his car to avoid hitting another competitor. A move that cost Tony a broken leg, but saved that man’s life. That’s why when I hear people say he turned intentionally to hit Mr. Ward, I just get angrier and angrier. People have asked the question should Tony Stewart be racing at these dirt tracks? My answer is yes (please note, my initial post said no, I hit submit, before I could edit it). Tony is a racer. Dirt racing is his passion. It’s his baby. How can you ask someone to give up something they love, something that is part of who he is. I am sure Tony is asking himself these very same questions. That was pretty much the only time I have commented about the tragic incident involving Tony Stewart until today. I just finished watching the press conference during my lunch hour. This would be the first time since the accident we would see Tony Stewart. Before he even said a word, I could tell he was still shaken up about the events from that night. You don’t have to be a race fan to know this accident has greatly affected him and will for a long time. I don’t know where he found the strength to sit in front of the media and speak from the heart. I am sure there will be those who will criticize him for not answering questions about, but I didn’t want him to. The investigation is still open and as he said, he is respecting the process of everything. If that sticks in your craw then so be it. His remarks were genuine. They didn’t seem forced, contrite, or arrogant. I believe he is truly sorry for what happened. Some of you may ask how can I be objective, you ARE, after all, a Tony Stewart fan. I have tried to remain objective–trying to understand and respect everyone’s viewpoints. However, it has been difficult. Part of it has to do with those who don’t even understand the sport of NASCAR. Frankly most people don’t care and won’t take the time to learn. Ask someone who doesn’t follow the sport what NASCAR is all about. You get the usual, “all they do is go in circles” or “all they do is make left turns”. NASCAR is just full of ignorant rednecks. Of course my personal favorite is, “you just love to watch because of the wrecks”. That’s fine–it’s their opinion. I have been known on occasion to rant about my love for NASCAR here in The Park. I am a NASCAR fan and a Tony Stewart fan! I will never apologize for it. I have been following Tony in NASCAR since about 2006. I chose Tony Stewart. He is the driver I cheer for each week during NASCAR season. I have shelled sums of my own money to buy souvenirs and autographed items. And some special people out there have shelled out money as well to buy me Tony Stewart gifts. I will continue to support Tony Stewart. I will continue to watch him race every year in NASCAR until he, dare I say it, retires. I believe it is time for Tony to return to racing. He needs it to continue the healing process. Grief has no time-table. It has not set pattern. We all grieve differently. I still grieve for both my parents who I lost in 2011. The pain of that loss will never leave me, but I have learned to cope in order to live my life. I believe that is what Tony is trying to do this weekend. I can believe the start of the 2014 season is upon us. There are so many story lines that have come out of the off-season. It has been one of the busiest off-seasons I have seen in a few years. Here are some story lines coming into the 2014 season. Qualifying–You will have three rounds at 1.25 miles or longer and 2 rounds at tracks less 1.25 miles. Round 1 = 25 minutes to post qualifying time-after which the 24 registering the fastest will advance to 2nd round. Those not advancing to Round 2 will be sorted based on 1st round times in descending order. Round 2 = 10 minutes to qualify, 12 fastest in this round will move onto the final round, those not advancing will earn positions 13-24 based on time. Final round = 5 minutes, fastest times from this session will determine 1-12 positions. There will be a 5-minute break between each round where teams can make adjustments. They will not be allowed to jack the vehicle or raise the hood and once the car enters the garage, it will no longer be permitted to return to the track for additional qualifying attempts. Of course is you are at tracks 1.25 or less, drivers will only have two rounds to get things done. Did you get all that? Jimmie Johnson–Will he or won’t he get to that magic mountain of 7 championships this season? I haven’t heard much chatter about it, but it is still early in the season. But I am sure somewhere down the line, it will be mentioned. Stewart Haas Racing–I think this is the team that you need to watch our for in 2014 (of course I am a little biased). SHR went from a three-car team to a four car team. SHR added new drivers Kevin Harvick (who replaced the departing Ryan Newman who is now in over at Richard Childress Racing) and Kurt Busch driving the #41. Danica Patrick will be starting her 2nd year in Cup. But all eyes I think will be on Smoke, aka, Tony Stewart. More about my thoughts on Tony later. Dale Earnhardt Jr.: I am interested to see how Dale Jr. will fare this year. It was announced that his crew chief, Steve Letarte, will be leaving at the end of the season to join NBC when they take over the final part of the NASCAR season next year. I am sure the good folks over at Hendrick Motor Sports have started looking at who will replace Letarte. Letarte has done good things for Junior since becoming his crew chief. I don’t cringe every time Dale is interviewed. He looks more relaxed and upbeat. Steve Letarte will be missed, but I am looking forward to him in the broadcast booth next year. The #3–It is time. It has been 13 years since the death of Dale Earnhardt Sr. Richard Childress has been very respectful about bringing back this iconic and revered number iconic back to the Cup level. Dale Sr.’s legacy to me is more than just the number. That’s what I focus on when I look back at his career. Is Richard Petty’s legacy diminished because someone else drives the #43? I know there are some small faction who would like to not see the #3 back on the track and that is ok. But I am excited to see it back on the track and I think Mr. Dillon will do the #3 proud. Note to those crazy loons who wear the aluminum hats–there is no conspiracy with the #3. Are you kidding me? You know how many people you would have to involve to pull off that kind of thing? You guys need to stop drinking that “special Kool-aid”. If you really want to scream NASCAR is on the take and fixed, how come Junior hasn’t won a championship or for that matter multiple championships? RCR has always had fast cars at the restrictor plate tracks. So take your aluminum hats and black helicopters and go back to figuring out something more important, like why do hot dog packages come in packs of 10 and buns in packs of 8! Sprint Unlimited–I liked the racing even after the 9 car crash that took out some of the major players in the race. There was side by side racing. Denny clearly had the car to beat it seemed. He won all three segments and stood in victory lane for the first time in the Unlimited since he won the thing back in his rookie year. Of course, the weirdest part of the night was when the pace car caught fire! You heard me, the pace car caught fire! I mean two years it was a jet dryer up in flames! At one point, I was waiting for the mayhem guy from the All State commercials to pop out! Thank goodness this race occurred AFTER Valentine’s Day. It looked like Danica Patrick was going to make it thorough the big crash, but only to be hit by her boyfriend Ricky Stenhouse Jr. It never saw her. I would have loved to been a fly on the wall in that trailer home to hear the conversation. I’m telling ya, it had to be the full moon that was hovering over the race track. That would explain so much! Tony Stewart–It has been a long off-season for us Tony fans. I mean, we haven’t seen our driver in a car since August. I for one am pumped to see Tony back in his #14! He seems very upbeat about getting the 2014 season underway. That was clearly evident on Saturday night. He looked great out there. It was if he had never been gone. But my excitement was short-lived thanks to that 9-car pile up courtesy of Matt Kenseth. Saw this quote on Twitter from Tony, “I’ve waited for 7 months to race, I damn sure wasn’t going to sit there and ride around.”. Now that’s the Tony I love! I am hoping 2014 is the year of #14. I want to see him win the Daytona 500 this year. Of course if he does all those crazy conspiracy loons will come out of the lead line caves screaming CONSPIRACY! But you know what, let them cry all they want. Just like Dale Sr., he has won everything he can at Daytona. He knows how to get around the place. But that just goes to show you how tough winning the Daytona 500 can be. Some of NASCAR’s best drivers, have never one a the 500. Hope that has caught you up to speed for Daytona. Now here are a few house keeping things I need to take care of. If you are in Raiderland or listening outside the boundaries of Raiderland, check at That Dang Ol’ Show. You can listen to the show on Monday nights from 6:00-8:00 pm on The Red Dirt Rebel (105.3). If the wind is blowing just right and the sun is setting in the west, you might just hear me call in and talk a little racing. Plus, you might learn a thing or two in the process. And finally….since there are only 5 days until Daytona (February 23, 2014)…I need to put the disclaimer out there for everyone. Attention to all of my family, friends, co-workers and complete strangers, NASCAR season is upon us. I will NOT be available for family functions, outings, or get-togethers on Sundays. If there is an event on said Sunday, you will have to understand they must be held prior to the start of the race or after the race. If you must schedule things during the raced be aware I may not attend your function or request that I have access to a television set. This also applies to races that are held occasionally on Saturday nights. If you wish to spend time with me, you must understand the topic of conversation will be predominately about the upcoming race, the previous Sunday’s race, Tony Stewart, or anything in general about NASCAR. This is the time of the year all projects are put aside unless they involve a NASCAR related event. Please don’t be offended if I ignore you on Sunday or the occasional Saturday…it’s nothing personal…IT’S NASCAR! I was going to write about Sunday’s race in the first part of the post, but with everything going on with SHR I thought I would lead with it this week. On sunday night while pursuing Twitter looking for more information about the race, I saw it. I saw there was a possibility that Kurt Busch might become a 4th team member of SHR. Yesterday it was somewhat quite on Twitter and Facebook with this story. All that I have seen is Kurt Busch has an offer on the table. I am not sure how I feel about this possibility. Kurt Bush has been having a good year running for Furniture Row Racing. He had another good finish on Sunday with a 3rd place finish. Kurt is currently sitting in 9th place in the standings. There are only three races left until the Chase begins (Bristol, Atlanta, and Richmond). I think he will make the Chase unless he completely implodes in the next three races. Kurt only is on a one year contract with FRR and it will expire at the end of the 2013 season. But Kurt Busch at SHR I just don’t know. Can you imagine Tony Stewart, Kevin Harvick, Danica Patrick AND Kurt Busch. These four drivers are never at a loss for words when it comes to dealing with the media. Kurt Busch, just like Danica, is polarizing. Everything I have read, people really hate this move or really like this move, there is no middle ground. I for one have never been a Kurt Busch fan. Of course I am not a Ryan Newman fan either. There have been those who wonder if you can find room, money, and sponsorship for Kurt Busch to be with SHR in 2014, why couldn’t you find the same for Ryan Newman? I am by no means an expect on this matter. I only see what is reported regarding this matter. Maybe Tony wanted to go in a different direction with his team. I mean he is investing his money into the team along with Gene Haas. To quote the Godfather, it’s not personal, it’s business. There is more to Stewart Haas Racing than just the drivers, he has crew members and other staff members that depend on the success of SHR. I am positive the decision to let Ryan go wasn’t easy, but in life you have to make tough decisions. On paper, both Ryan and Kurt have roughly the same numbers. They both started racing in Cup in 2000, with Kurt going full-time in 2001 and Newman full-time in 2002. Kurt does have a championship under his belt back in 2004. Note he was the first driver to win a championship under the Chase format. Of course, there is more deciding which driver drives for which particular team every year. Sometimes it is about what is best for the team, or what the driver whats, or lately, sponsorship. I guess we will all have to wait to see how this all shakes down for SHR. In other news coming out of SHR, it was announced yesterday that Tony Stewart will be out the rest of the season and Mark Martin will take over driving duties for the rest of the season. Mark will begin his driving duties in the #14 starting with Bristol on Saturday night. The only race that Mark will not race is Talladega where Austin Dillion will once again to the helm of the #14. This gives Brian Vickers the opportunity to get into the #55 earlier than expected. I think this is a good move for Tony. The team will have consistency with one driver the rest of the season. Even this late in Mark’s career he is competitive. I think he would have won the race on Sunday if he hadn’t of run out of gas. Both drivers have a deep respect for each other. Several years ago Mark Martin said Tony Stewart was one of the greatest drivers in NASCAR. I am happy with this choice. Besides this will sort of force my hubby to cheer for the #14 each week. I know Mark will give it his best when he gets behind the wheel of the #14. I am thankful SHR is going with one driver (other than Talladega) for the rest of the season instead of the “insert driver here” every week. If someone out there is questioning this decision all you have to see is what Tony Stewart said about mark Martin… “Mark is someone I’ve looked up to my entire career and I have a tremendous amount of respect for him.” That right there says it all for those naysayers out there. I was going to write about the race in another post, but with That Dang Ol’ Racing Show broadcast looming tonight, I wanted to get things posted before then. This would be week two without Tony in the #14. Austin Dillion was tagged to drive for the #14 team for the race. He qualified 27th and finished 14th. Thank you Mr. Dillion for your support. See ya at Talladega. Now on to the race. Joey Lagano was on fire during the weekend. He set a track record and grabbed the pole for the Pure Michigan 400. I was watching practice (which I rarely do) and in an interview with Brad K. he thought his teammate was going to be the man to beat over the weekend. I was wondering if the race was going to be a long race by the way it started out. There were 3 quick cautions which started with Clint Bowyer’s spin on lap 1. The next two, I was wondering if I jinxed. Every time I would go into my kitchen, caution. Let’s just say I was banned from the kitchen until commercial. Despite the early cautions, the race started to settle down. If you were watching the race, you know that Jimmie Johnson crashed in the last practice session and had to use a back up car that was slated to be used for Chicago (the first race in the Chase). And as you know, since you were watching the race, ESPN was keeping track of Jimmie’s progress towards the front. Yes, ESPN I got it. Jimmie was starting in the back and he was going to make his way to the front. But you don’t have to make it your goal to let us know every chance you got. For those who don’t know, Jimmie made his way to the front in 45 laps and was able to lead a lap prior to the start of the first green flag pit stops. Jimmie’s day however was short-lived. He was out of the race around lap 58 with a blown engine. For you Jimmie fans out there, this didn’t affect his Chase chances on any level since he is leading the points right now and has already punched his ticket for the Chase. Turn 2 was not kind to several drivers throughout the day. Several drivers ended up spinning out or hitting the wall. Turn 2 got Clint Bowyer, Ricky Stenhouse, and the ever popular Kyle Busch. Dale Earnhardt had a decent day, leading laps and looked like he was to give himself a chance to win the race. Dale’s day went south around lap 135 when he hit the wall and sustained heavy damage. This was the 2nd car from HMS that had a bad day. Dale finished 36th and lost one spot in the standings. He is now sitting in 7th spot. So have no fear Junior nation, your driver is still ok. My husband was trying to convince me to pick the #88 for my race pick contest. He seems to do pretty good at Michigan, but my gut said no. He is just like picking Ohio State in the NCAA basketball tournament. Looks good on paper, seems like a sure thing, but in the end all you get is heartache. And Sunday was just an example of that. Joey Lagano was the man of the weekend. He was poised to take the win after Mark Martin ran out of gas with three laps to go. Mark Martin had nothing to lose with his gamble. He wasn’t fighting for a spot in the Chase or trying to keep his spot in the Chase. So why not gamble on fuel mileage, unfortunately the gamble didn’t pay off for Mark. Mark finished 27th. When Mark ran out of gas, there was Joey passing him for the lead. This would mark Joey’s first win since moving over to Penske this season. This win snapped a 44 race winless streak for Joey. More importantly for Joey, this put him back in the race for a wild card spot. He moved up 3 spots to 13th in the standings just 7 points behind Martin Truex who has the last wild card spot. This wild card race is getting pretty interesting especially now that Tony Stewart is out for the season. Once again, I think this will all come down to Richmond to see who grabs the two wild card spots. If Kasey stays out of the top 10, he will have a secure spot since he has two wins. Of course this could all change, if one of those sitting around him in standings with one win gets a win in the next three races. man I am going to love the next three weeks! I am beginning to find myself cheering for Clint Bowyer each week. The more and more I watch him in interviews and watch on the race track, he is the type of driver I could get behind. I would love to hang out with Clint maybe go fishing and have a few beers with. And if you can hang with the Duck Dynasty crew and get what Duck Dynasty is all about, then you are good people in my book! For those living under a rock, Speed TV is no longer on the air. It is now Fox Sports 1. I am going to give Fox Sports 1 a chance. When ESPN started back in the day, I am sure they weren’t lighting it up on a daily basis. They have had a few years to fine tune their programming. Race Day has been pared down to one hour. I may be in the minority on this, but I am glad it is now down to one hour. In years past, Race Day would air right up until race broadcast time. For example, if the race broadcast pre race show began at noon, Race Day would end at noon. I would then switch over to the race and watch that pre-race show. Sunday, Race Day ended an hour prior to ESPN’s pre-race show. Some were upset by this change, but for me I just rolled with the flow. Juan Pablo Montoya is out of the #42 at the end of the season. Silly season is in full swing folks! Let the rumors and half-truths begin! Launch the black helicopters and drones! Kyle Larson’s name has been mentioned as a possible replacement for Juan in the #42. This would be a WRONG, WRONG, WRONG, move!!! Kyle is in his rookie season in the Nationwide Series. Prior to this weekend’s race at Mid-Ohio, he has only 21 starts under his belt in Nationwide and was sitting in 8th spot. He does have 2 starts in Trucks with one win and a 2nd place finish at Eldora. I think Kyle needs to get more experience in NASCAR before being thrown into the shark tank. AJ Allmendinger’s name has been kicked around for a possible replacement as well as Ryan Newman. Either one would be a better choice than Kyle Larson into the seat. Speaking of JPM, saw an interesting story on ESPN.com. Michael Andretti would love for JPM to come race for his race team. But as with NASCAR, it is all about sponsorship. If Andretti can find sponsorship, could Juan be headed back to Indy Racing? It would be interesting to see how that all shakes out. Brad K. was going to gamble for the win on Sunday, but wasn’t going to be really close on fuel. Points racing is not what drivers like to do, they want to race for the win, but sometimes IT IS about the big picture. Brad and his team decided he needed to come down to get gas and finish the race without the win. By the way, Brad finished 12th. I am sure it wasn’t what he wanted, but it kept him in Chase contention. If he would have run out of gas, he would have definitely finished further on back. If you haven’t seen the show Duck Dynasty, what are you waiting for? This is one of better shows on television at the present time. Yes, it is a reality show, but not like all those other ones out there. The Robertson family is funny! Yes, they are rednecks and at times I wonder about Uncle Si, but in the end they are all about family and God. They sit down to dinner with each other and you see them pray. There’s nothing preachy about it at all. It is one of the few shows I can watch with everyone in my family. I don’t have to worry about language or other things my two children will pick up. It’s tough finding shows that I can sit down and watch with my kids. Gone are the days of Dukes of Hazzard, Full House, Little House on the Prairie. Now we have shows like Dance Moms, Honey Boo-Boo, and the Real Housewives. Don’t get me wrong, I know there are those of you out there who watch these shows, but there aren’t the kind of shows I can sit down and watch with my kids. So if you haven’t watched Duck Dynasty, stop on over at A&E and watch! Non-NASCAR related–my youngest son loves to watch the Mickey Mouse Clubhouse on the Disney Channel. It is a pretty decent show for the younger crowd. Kids can learn things from watching the show. It’s not on the same level as Phineas and Ferb, but it is still a decent show for kiddos. However, if I hear the phrase “oh tooldles” or see the “hot dog dance” one more time, I think you will have to lock myself up for the rest of the summer! Of course both boys will start school come Monday, August 26. My oldest will be in the 4th grade while my youngest will be starting Pre-K! To all parents out there, not much longer…6 days! Don’t forget about tonight’s broadcast of That Dang Ol’ Racing Show on Real Country 98.5 FM here in Lubbock, Texas from 6-7. I was all prepared for last week’s show. I had to make a run to Barnes and Noble with my other half so he could get his fantasy football magazines. I had cell phone in hand and yes, that was me in B&N with ear buds on. To be clear, it was just one ear bud and not both. But due to technical difficulties and things beyond my control, the show was postponed to Wednesday. Wednesday’s show was scratched as well. And so here we are this week. The delay for the 2nd broadcast hasn’t deterred me in the least. I will be tuning in tonight to listen to the discussion and maybe I might just call in! Since the news came there would be a local racing show, it has jump started me back into my blog. It does help that I am a stay-at-home mom. I can keep better track of things and maybe provide a little more in-depth analysis here in The Park. I have been providing my take on NASCAR for several years now. It has allowed me to meet fellow NASCAR fans across the US. Even though I don’t know them on a personal level, I feel connected to them because we are part of the NASCAR Nation. I have always maintained The Park as a place for discussion and debate. I welcome it. The words I type here are my opinions and my viewpoints. They may not always agree with the majority of those of you out there, but that’s what makes things fun! If we all agreed, it would be boring. I know what I am talking about. I research things using NASCAR.com, ESPN, Fox Sports and yes, Twitter and Facebook. I even read other’s blogs who provide other insight. I try to be entertaining for those who stop by to read my posts. I am not too concerned whether or not my readers comment (even though secretly I wish someone would), I am just hoping I can get more readers and maybe, just maybe someone might notice my work. For those who stop by thanks for your support and for those first timers, WELCOME! Have a great day! The first thing I didn’t want to hear on Tuesday morning was the news about Tony Stewart. First of all I am not a morning person and to get that kind of news early in a day doesn’t set a good tone for the rest of the day. I received a text from my husband at 7:45 am. Yea, thank you sweetie. So as we all now know Tony Stewart was racing in Iowa Monday night where he crashed his car and ended up with a broken tibia and fibula in his right leg. Basically the bones that are located in the lower part of your leg were the ones he broke. His first surgery was to stabilize his leg and clean the wound. In his second surgery he had a metal rod placed inside his tibia. Looks like a long road of recovery for Mr. Stewart. Get well soon Mr. Stewart! Of course with his accident on Monday night, everyone has been debating whether or not Tony should be risking his chances at another championship by racing in other racing series. I have been on the fence about this one. I am not all that thrilled that his 2013 season is pretty much done with even if he were to try to make it back. But on the other hand, this is what Tony Stewart does. He’s a racer. Tony knows full well what can happen to him when he steps into any race car. If this would have happened while he was driving his Cup car there wouldn’t be as much debate. But since it happened during his off time away from Cup, the debate rages on. Should Tony even be racing in other series and risk his career? What if you are Mobile 1 or Bass Pro Shops, do you really enjoy watching your investment racing in other series other than Cup? His sponsors have invested millions of dollars into sponsoring the #14 team with Tony Stewart behind the wheel. 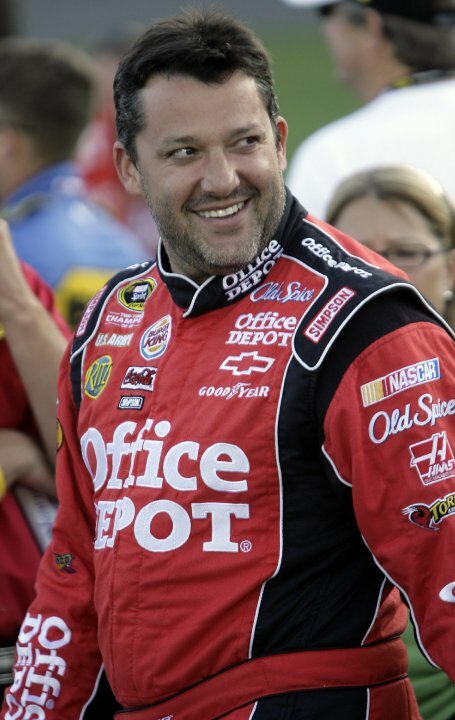 Tony Stewart is a bankable star in NASCAR. Even when he has a bad day, he is still worth all the money a sponsor invests in his team. He has three championships under his belt. He is one of the top stars in NASCAR and he gives it his all every week. Definitely a sound investment. But now what? Max Papis will be replacing Tony this weekend at Watkins Glen. As for future races, a replacement driver has not been named. No matter who it gets behind the wheel, it will be strange not to see Tony racing. I will be cheering on Max Papis this weekend at The Glen. I would love for him to win, but if he can’t, I hope he will make a good showing for the morale of the #14 team and Smoke Nation. Denny Hamlin vs Kyle Petty: Once again Kyle Petty’s comments about a driver has sparked controversy. Earlier in the year it was about Junior, then Danica, and now Denny. Regardless of what you think of Kyle Petty, he does have some insight about the sport that others don ‘t. He is the grandson of Lee Petty and son of Richard Petty. He pretty much has been part of the sport since birth. I had a chance to meet Kyle when his charity ride made a stop here in Lubbock last year. I may not always agree with his opinions, but I think he is good for NASCAR. To me he speaks his mind and isn’t afraid to apologize when he is wrong. He says what everyone is thinking. He doesn’t it play it safe like some commentators sometimes do. I will admit I didn’t take too kindly to his remarks about Danica Patrick, but I respect his opinions. On August 17, 2013, SPEED TV will no longer exist as we know it. It will become the new Fox Sports 1. Most of my Speed television viewing was centered around NASCAR. However, I did find myself watching other shows on the channel. I watched Dale Jr. “Back in the Day” (which I so miss). Because NASCAR didn’t start until February, I was able to watch the 24 hours at Daytona. To me this signaled that NASCAR was around the corner. I loved watching motorcross. I will miss Wind Tunnel hosted by Dave DeSpain the most. I found myself tuning in every Sunday night. He did cover NASCAR, but he also discussed other racing series as well. He said it like it was and wasn’t afraid to give his opinions. Just like Kyle Petty, I may not have agreed with him on occasion, but I respected his insight. I guess that’s what I look for in my commentators. Thank you Dave! I hope you find a place somewhere so you can keep on giving us your insight. Along the same lines with the whole change over to FS1, why doesn’t NASCAR look into creating their own channel? I mean if we can have a Golf Chanell, why can’t we have a NASCAR channel? I think this would be a great avenue for NASCAR to showcase their sport. I would love to be able to watch the lower level series in NASCAR (i.e. ARCA). Could they fill 24 hours of programming over 365 days? Why not? The Golf Channel does it. The NFL network does it, even in the off-season. Come of Mr. France let’s give it a go! I am not being paid or am I compensated in any way. This is just a shameless plug from one Tony Stewart to another Tony Stewart fan. A new local radio program debuted this past Tuesday night. The show is called “That Dang Ol’ Racing Show”. The show is hosted by Ryan Hyatt. For you folks who live in and around Raiderland, this name is very familiar to you. He hosted the Williams and Hyatt Show for many years. Now he has taken his passion for NASCAR and racing to the airwaves. I for one was excited to know there would finally be a forum for all of us NASCAR fans out here. It sometimes isn’t easy being a NASCAR fan in the state of Texas. I mean seriously, football is our state sport. But as much as I love football and baseball, NASCAR is my obsession. I am hoping others out there will tune in on Tuesday nights from 6-7 pm on Real Country 98.5 to listen. I for one will be and who knows I might even call in every once in a while.